In the US, they call in Blackjack. In Britain, it is Pontoon. This is a variation of the game Twenty-One. Again, the game was based on the French Vingt-et-un from the 1700s. This Pontoon has a variation known as Shoot Pontoon and uses that Shoot mechanisms. The game can be played by 2 or more players leading up to an ideal 8. There is a standard deck of 52 cards and for larger sets, 2 decks are used. To bet, the players will use chips to substitute for money. Again, the cards have similar values to conventional games. The ace has values 1 or 11 and then 10 is the value of face cards and the numeric 10 card. The rest is based on the numbers imprinted on them. Your goal is to reach the number 21 without going overboard or exceeding the said value. One player serves as the banker and has more advantage. For each hand, the players will bet that they have higher values than the banker's own set. The best hand is called the Pontoon and it is made up of 2 cards with a sum of 21. 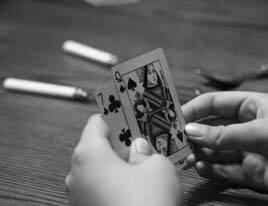 Following Pontoon is Five Card Trick which the player has a total of 21 with 5 cards. If you have 3 or 4 cards equal to 21, you can beat almost all except for the Five Card Trick and Pontoon. If the hand has 20 or lesser, and the number of cards is less than 5, the value will be ranked from the nearest value to 21. Do not bust or go over 21. Even if the banker and the player have similar values, the banker wins.